Kouli Coffee 口力口非 opened in November of 2016. I've noticed quite a few coffee shops opening lately that have similar menus with affordable prices. Not all of them are making quality drinks, but Kouli Coffee is definitely one of the good places. They have two cup sizes: small and large. Their small is the same size as other places' medium, so keep it in mind that you're really ordering a medium (not a small) or a large. The shop is small and is more of a to-go coffee joint, but they do have some seating: a table with four chairs and a bar-stool seating area. I rest most of my evaluation on a place's cappuccino, because it's my favorite drink, besides the flat white, but that drink is rarely found in Taiwan. I don't care about the foam in a cappuccino, I just like it better than a latte because there is less milk in it. I like to taste the espresso shot(s) (the coffee) in my drink; if a drink tastes solely of milk, I regret my purchase and don't come back. If I wanted to drink hot milk, I'd buy hot milk and not coffee! Then I assess how well the barista steamed the milk and blended it with the espresso shot(s). If they did a good job, the drink will have some thickness to it and not be too runny like water. However, even if they mess up on this step, I'll still enjoy my drink if they nailed the first point I made and the point I'm about to make after this one (caffeine). If I don't feel the caffeine surging through my body halfway through my drink or when I finish, that means the drink failed the caffeine content test. Price is also a factor, I usually won't buy coffee at a place, or will visit very infrequently, if their cappuccino costs more than NT$100. 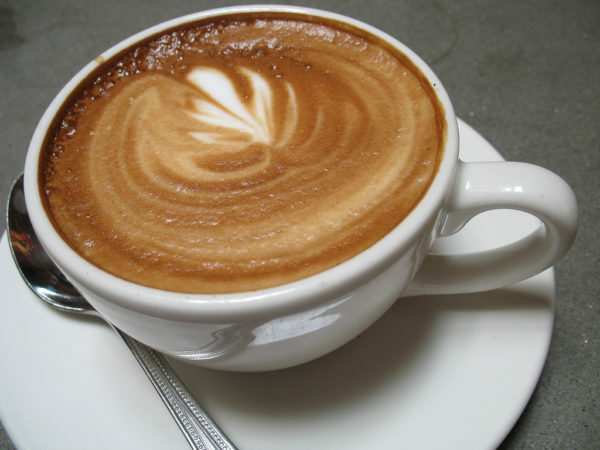 Did you know that a cappuccino throughout all of Italy only costs an average of 1.36 € (NT$45)? I'll also say that there is something special about having your coffee in a shallow wider cup instead of a typical mug. Kouli Coffee pasts all these tests -- well, not the shallow wider cup, but that's just a preference of mine and doesn't really matter. Coffee is highly regarded in my life, so I am always deeply appreciative when a coffee shop performs admirably. After ordering a cappuccino at a place, sometimes on my next visit -- if I revisit -- I may be tempted to try a different drink on their menu, but 95% of the time I end up trying other drinks solely for my reviews and pleasing my readers: not everyone's favorite drink is a cappuccino and a review is kind of boring if only one drink at a place is critiqued in a review. So I hope you appreciate all that I do for you, my readers. If I wasn't reviewing places, I'd be ordering cappuccinos almost exclusively. Besides the cappuccino, my second favorite drink at Kouli Coffee was their mocha. The chocolate powder used contains no sugar, so you have the option of choosing how much sugar you want in your mocha. I tried it hot with no sugar and it ended up having a nice mix of chocolate and coffee flavor and didn't taste too bitter for me. However, I never add sugar in my cappuccinos and prefer sugarless coffee, so a mocha made this way suits me, but maybe not for you. I also tried the mocha iced with 3/10 sugar and was happy to have tasted that the sugar was barely recognizable, instead of being sweet, it smoothed out the chocolate's bitterness. If you like sweet drinks, order it with full sugar and you'll love it, hot or cold. Sometimes, although very rarely, I like to gulp down a super sweet iced coffee drink on a hot summer day. If you have drunk at Kouli Coffee before, what is your review? Dritan Alsela with great latte art artists from Taiwan.